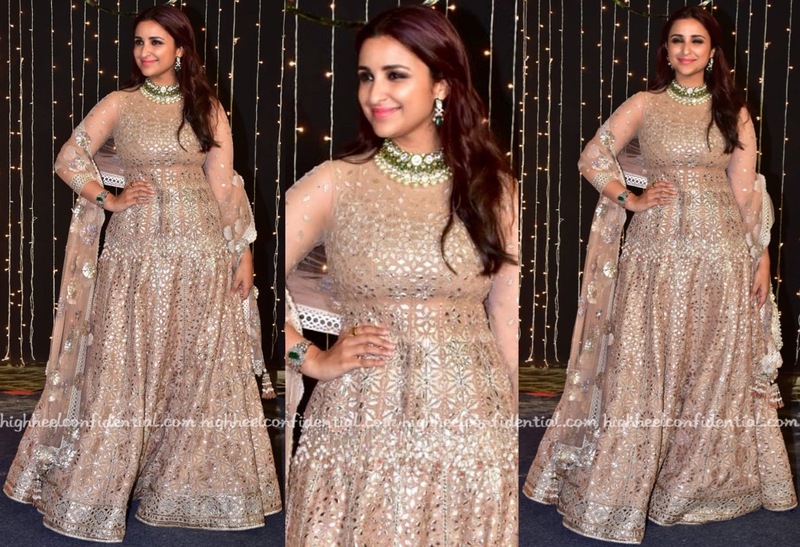 Wearing Manish Malhotra Tarun Tahiliani, Parineeti attended her cousin’s wedding reception in Mumbai. Polki jewelry and pink lip color rounded out her look. The color helped balance out all that gota on the ornate anarkali; Parineeti looked nice. 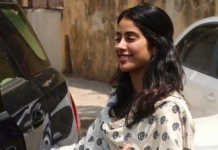 What’s the designers’ obsession with gota? This makes her look like she has no torso! Her bust ends and legs start immediately. It’s ill fitting… parineeti can do much much better..
And yet she never does. I honestly don’t think she can do better at all. Her midriff looks weird , the cut of the outfit is all wrong , makes her look bigger , however she did look better than her own cousin ! How many lehengas bearing the exact same design did we see this wedding season…where is the novelty? Where is the creativity? This lehenga is atrocious and disproportionate..makes her look double her size. Do these celebs really own mirrors? I wouldn’t wear this even if paid to. This is WRONG on all levels !!!! Rest my case . So glad that everyone wore their uniform. The class of 2018 ! Yay. When Nick will look back on tho day he will remember a flock of white shimmer white doves.